Reluctant to commit to the permanence of a knuckle tattoo, but yearning to express yourself? Here is your solution. 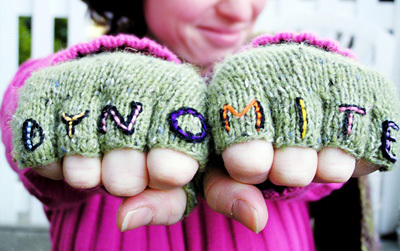 Embroider the eight-letter text that says you onto these quick-to-knit fingerless gloves and the world will know just what you stand for. 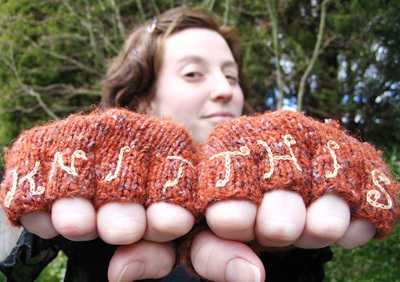 Knit your Knucks from the knuckles down -- a fast knit on size four needles. 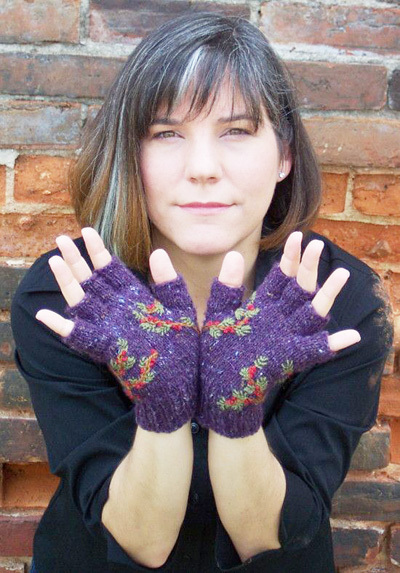 Working down allows you to split the yarn into two balls and knit until the balls run out -- achieve extra-long matched-length gloves with no anxiety. Choose between a ribbed cuff with a sewn cast-off and a textured cuff with a crab stitch edging. Included are simple tutorials for both. Learn something new, yo. I've selected two Rowan yarns, Felted Tweed and Wool Cotton. Felted Tweed is amazingly light and surprisingly warm with beautiful highlights of color, while Wool Cotton is simple and cozy with a bit more weight. 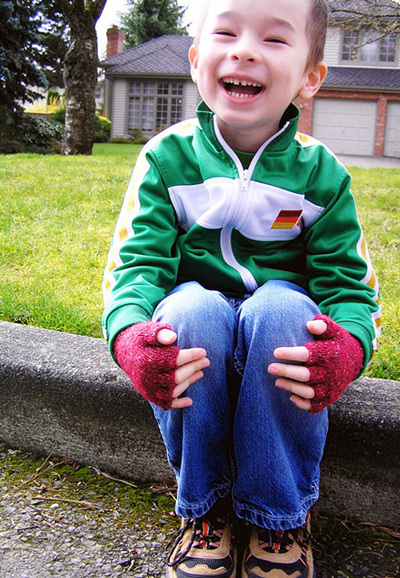 One ball of Felted Tweed is enough for both a woman's and a kid's set. This pattern has been tested to within an inch of its life by my knitt'n crew. Peruse our brainstormed list of text ideas here, or come up with your own fabulously original quip. 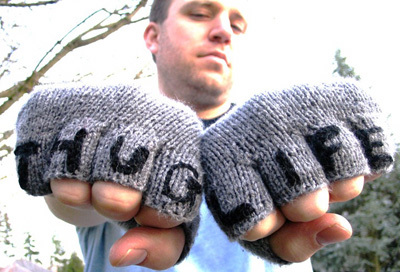 Whip up knucks for your entire posse. What you say, knitta? 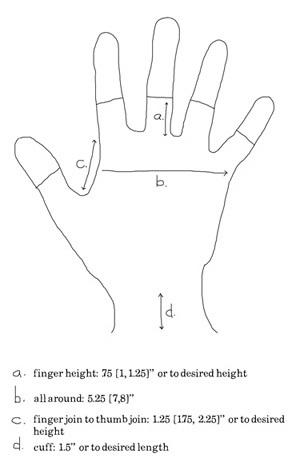 These measurements were taken, unstretched, around the upper palm of the completed Knucks. They have a lot of stretch and fit a wide range of sizes. Embroidery alternatives (optional): beads, puffy paint, rhinestones, patches, etc. It is highly recommended that you skim through each section of the pattern before proceeding, even if you're really experienced. There are some tricks. These gloves are designed so that there is no "right" or "left" glove; both gloves in a pair will be identical (until they are embroidered!). Avoid Finishing Work: When casting on the finger tubes and joining to work in the round, hold the cast on tail with the working yarn and knit one round with both strands held together, then snip the tail. This eliminates the need to sew in the CO yarn tails later. When working the next round, remember to knit the two loops together as one stitch. This makes a nice durable edge and reduces the finishing work to be done later. Tutorial with photos and a video can be found here. Instructions for this bind-off method can be found here. If you are typically a loose knitter, you may want to switch to a smaller size to knit the ribbing to maintain a snug fit. Note: When making fingers, label each finger as you complete it. Loosely CO 14[16, 18] sts. Distribute evenly between needles and join to begin working in the round, being careful not to twist. Work in stockinette st until work measures 0.75[1, 1.25] inches, or desired length. Break yarn, leaving a 6-inch tail, and place all sts on waste yarn. 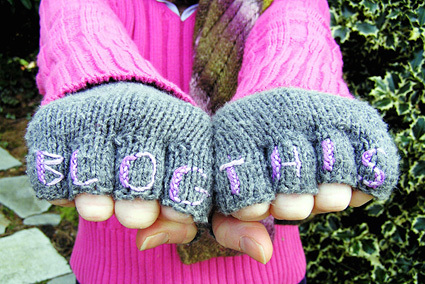 Make a note of how many rows you have worked, so that the second glove may be worked exactly the same way. Loosely CO 10[12, 14] sts. Work as for thumb. Loosely CO 12[14, 16] sts. Work as for thumb. Loosely CO 12[14, 16] sts. Work as for thumb; do not break yarn. Divide sts evenly between 2 needles. Place first 6[7, 8] sts of ring and middle fingers and first 5[6, 7] sts of little finger on one needle with litle finger at end; place remaining sts of these fingers on a second needle, as shown. Note: When working Joining Round, pull yarn tightly when working first and last sts of each finger, to avoid forming gaps. 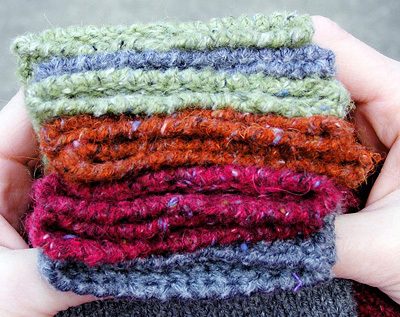 Do not weave in yarn tails from separate fingers as you go; instead, leave these until the finishing stage, when they can be used to close the gaps between the fingers. Joining Round: Using one needle, k first 4[5, 6] sts of index finger, ssk, k first 2 sts of middle finger together, k2[3, 4], ssk, k first 2 sts of ring finger together, k2[3, 4], ssk, k first 2 sts of little finger together, k3[4, 5]; using second needle, k next 3[4, 5] sts of little finger, ssk, k first 2 sts of ring finger together, k2[3, 4], ssk, k first 2 sts of middle finger together, k2[3, 4], ssk, k first 2 sts of index finger together, k4[5, 6]. 34[42, 50] sts. You are at the beginning of the round; place a safety pin or other marker here to indicate this. When working next round, work stitches onto 3 or 4 needles, to make the work less awkward. Continue in stockinette st until work measures 1.25[1.75, 2.25] inches from join. 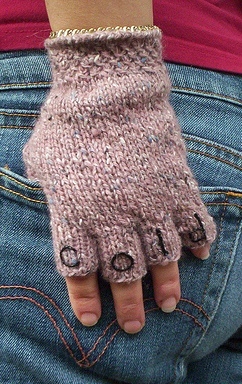 Make a note of how many rows you have worked, so that the second glove may be worked exactly the same way. Work one more round, dividing sts between 2 needles, so that they are arranged as they were for the joining round; work ssk over last 2 sts. 17[21, 25] sts on first needle, 16[20, 24] sts on second needle. 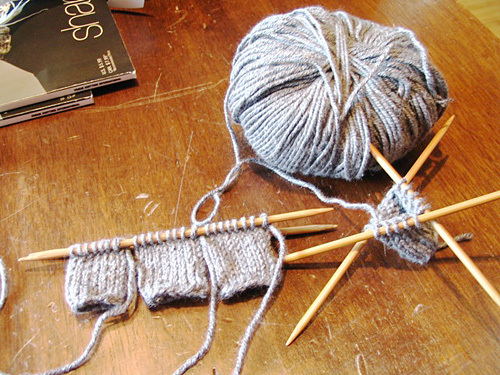 Place thumb sts on 2 needles, placing 7[8, 9] sts on each needle. Continuing with second needle of last round (after ssk), place stitch marker, k first 2 sts of thumb together, k next 5[6, 7] sts of thumb; using another needle, k next 5[6, 7] sts of thumb, ssk, place stitch marker, k first 2 sts of next hand round together, k to end of needle. 44[54, 64] sts. K the 22[27, 32] sts from next needle onto 2 needles, dividing sts evenly. Place safety pin at this point (center of thumb) to indicate beginning of round. Divide sts between needles as desired when working next round. Next Round: K to 2 sts before first marker, k2tog, k to second marker, ssk, k to end. Repeat these 3 rounds 4[5, 6] times more, removing markers on last round. 34[42, 50] sts. Next Round: K2tog, k to last 2 sts, ssk. 32[40, 48] sts. Work Textured Cuff OR Ribbed Cuff. Round 1: [Sl 1 purlwise with yarn in back, yo, k1, pass slipped stitch over last 2 sts] to end. Round 4: K remaining sts. Repeat Rounds 1-4 until cuff measures 1.5 inches, or desired length. BO using Single Crochet Bind Off method. Work 1 round Crab Stitch. Repeat this round until cuff measures 1.5 inches, or desired length. BO using Sewn Bind Off method. There should be yarn tails hanging at the gaps between the fingers. Thread each yarn tail onto a sharp needle and sew up the holes. Less is more: I suggest looping around the center two stitches and drawing the hole closed, then turn the gloves inside out to sew up any holes that remain. Sew in and snip remaining yarn tails. Visit the Knucks gallery and submit your photos! After some coaching from my embroidery genius friend Elizabeth and after a little bit of practice, I was able to get the results I wanted using the simplest technique: Chain Stitch. Nice tutorial with video here. I used this technique for KNIT THIS. Before embroidering, I sketched out the letters on scrap paper. Then, using two strands of cotton embroidery floss and a fairly sharp needle, I chain stitched the outline of my letters onto the gloves using tiny stitches. For THUG LIFE I fattened up the letters by running thin rows of chain stitch next to each other. Alternatively, you can outline and then fill in with more chain stitch. For BLOG THIS and DYNO MITE I used Pekinese Stitch, illustrated nicely here. 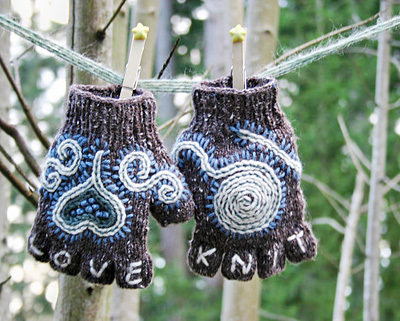 For LOVE KNIT, Julie used chain stitch. She also backstitched inside the chain for added interest. French knots accent the heart design and the letters were backstitched. For DAMN COLD, Patti used puffy paint from her local craft store. She rolled up bits of paper to stuff into the finger tubes to prevent the paint from sticking the tubes closed and painted the letters on in under 3 minutes. Then she put them high on a shelf away from little hands to dry (about 24 hours). For Elizabeth's "Rowan Tree" knucks, she used a single strand of Paternayan tapestry yarn to embellish the phrase HARM NONE in blue chain stitch overlapped with soft green. She also used chain stitch for the rowan tree trunk and branches. The leaves were added using leaf stitch, then the rowan berries using Chinese knots spaced in clusters. Elizabeth found it useful to weave in the ends on the back of the embroidery where possible, rather than in the fabric of the knuck so that the embroidery yarns would not show through on the right side. Elizabeth notes: The rowan tree has a reputation in folklore as a protective, life-giving tree. In the Scottish highlands, rowan trees have traditionally been planted near entry doors as a sort of precaution or good luck charm. 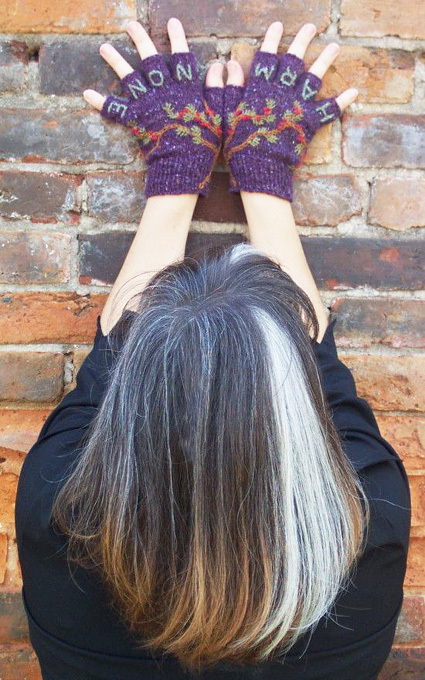 For knitters, Rowan means gorgeous yarns. To combine the two was a real pleasure. Pamela Grossman has two kids and lives in the suburbs with her one husband. But she's still really really cool. 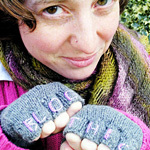 Read her blog, visit her biz or her boutique, and come post pictures of your completed Knucks on her knitting forum.